A significant prosthesis or a medical technology equipment – undecided as of now as the movement towards achieving a human muscle-like robot is in its nascent stage. Being an open source project, you can have a look into the scientific approach adopted by the scientists at Reconfigurable Robotics Lab (RRL) from Ecole Polytechnique Fédérale de Lausanne to optimize a robot to be an integral part of a human body. This is not the first effort taken to empower soft robots yet a challenging aspect was covered. And depending upon the development, they promise to improve the product. Framed with elastomers, these air actuated figures are expected to help people move and the product itself is harmless to the body. These Band-Aid looking artificial muscles have specific ‘soft balloons’ that also work as the primary section. Controlling various modules using a predictive model has been the current objective of the corresponding research paper. According to Jamie Paik, RRL director, the project design is a safety-first agenda. Application wise, it will largely contribute to patient rehabilitation, handling fragile objects, biomimetic systems and other sectors requiring an in-depth involvement. The prototype version sports a series of compartments with chambers placed at required interval. After analyzing the simulation results, lead author – Indian origin researcher Gunjan Agarwal implied that their contemporary work reveals how actuators deform as a function of their shape, composition and thickness. Point to be noted, these robots can stretch up to 5 to 6 times their normal length and bend on both sides. In the documented work, the group has shown how a paper origami cover could openly accept other materials for making the components. Additionally, the hard-to-control soft robots would now be easily adopted and redesigned with the step by step process explained by the team for robotics enthusiasts. A slightly different approach taken by the RRL scientists highlights its use in medical technology. Matthew Robertson, the researcher in charge of the current project said that the team jointly with physical therapists from the University Hospital of Lausanne (CHUV) planned to assist people in time of exercise. For now, the output is chalked as a belt which will be able to hold the patient’s torso and reinstate motor sensitivity. Currently the system is attached to an external pump which will be soon replaced by a self-sustaining mini tool. The main effort to originate these tiny creatures direct the world to see its potential in making adaptable robotic appliances. Whether a small one or large, these simply can replace everything with a single type showing properties according to the specific need. The first part of the research report has now been published in Nature-Scientific Reports. 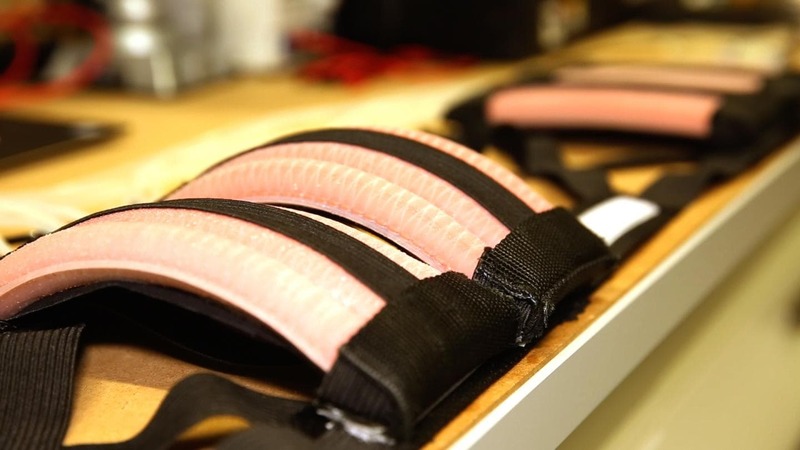 The second part, highlighting a medicated belt has been published in the Soft Robotics journal.